November marked the first major battle between US forces and the People's Army of Vietnam (PAVN), known to us as the NVA. Officially labeled the Pleiku Campaign, it earned a Presidential Unit Citation for the entire 1st Cavalry Division. There were many fire fights, but the two largest battles were at LZ X-Ray, and LZ Albany. The 2nd Battalion 5th Cavalry was moved from the 2nd Brigade to the 3rd Brigade and joined the campaign on November 12th. 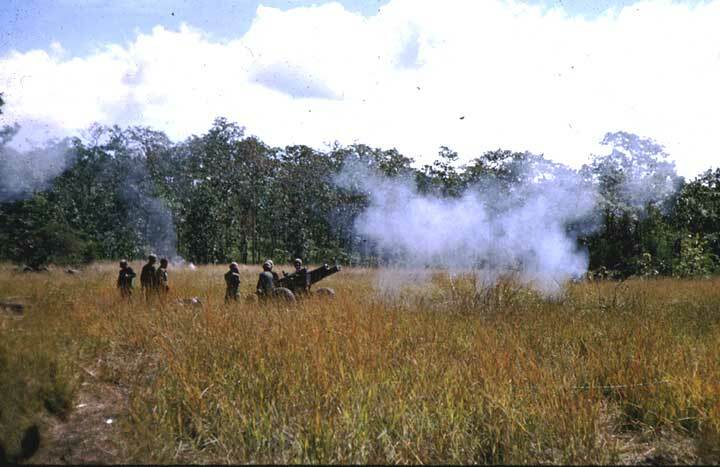 Since late October, other units of the 1st Cavalry Division had made contact and been in firefights with units of the People's Army of Viet Nam (PAVN), or what we called the NVA. 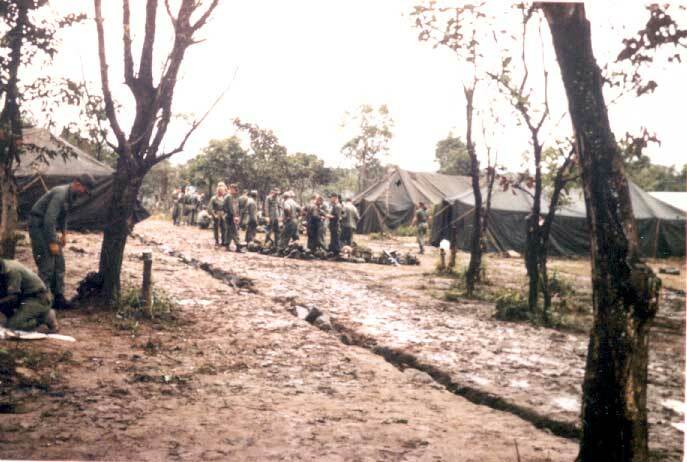 The Special Forces camp at Plie Mei had been attacked by NVA troops. The attack failed, but helicopters of the 1/9th Cav had pursued the enemy, and ground troops of the 1/9th had captured an enemy hospital. 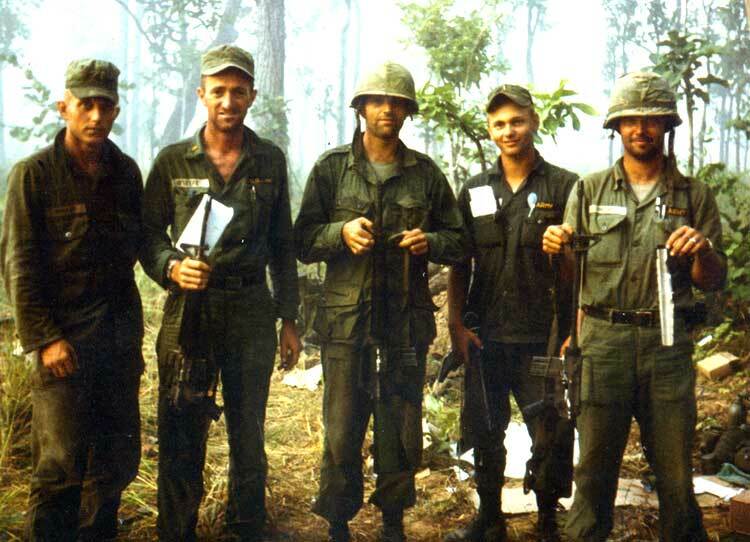 The 1st Cav was now looking for the main part of the NVA forces, and the 2/5th Cav was called in to help. Charlie Company, along with the rest of the 2/5 Cav, combat assaulted into a new LZ named Victor, about 3.5 kilometers (clicks, in the vernacular) southwest of LZ X-Ray, where the 1/7 Cav was fighting to stay alive. Their mission was to move overland from LZ Victor to LZ X-Ray and relieve the 1/7 Cav. At 8:00 AM the morning November, the 2/5 Cav moved out from Victor with Company A and Company B abreast, and C echeloned to the left rear. The march to LZ X-Ray took about four hours and was uneventful, though A Company had some light contact. Charlie Company did some fighting. 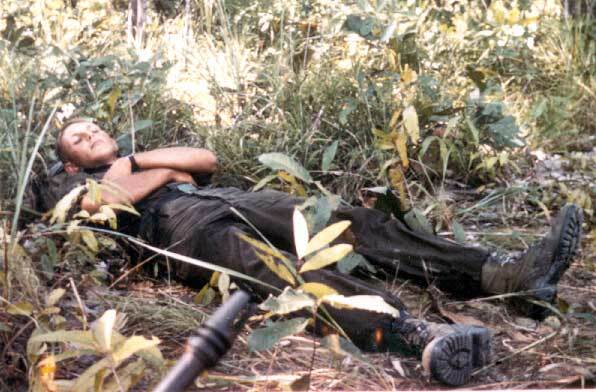 SSG Jack Hembree recalls holding a "Mad Minute" at dawn of the 16th, and he shot an NVA sniper out of a nearby tree. He also recalls SSG Juan Cruz being awarded the Bronze Star Medal with "V" Device for carrying mortar ammunition across an open field under heavy enemy fire. A bomb run by U. S. Air Force fighters on the Chu Pong Massif west of X-Ray. NVA troops were massed on this mountain, and the NVA headquarters was located there as well..
2LT Jim Mullen taking a break at LZ Columbus. Hey Ed - you brought the artillery in a bit too close, eh? On the night of November 16th, C Company held part of the perimeter. Artillery was called in so close that some M-16s were damaged. It was miraculous no trooper was hit. From left to right, 2LT James Mullen, 2LT Donald O'Keefe, CPT Ed Boyt, 1LT Don "Saint" St. John, and the artillery forward observer, 2LT Wallace. Note Wallace is holding up the shattered piece of the fore stock of his M-16. Click on map to see larger version. Caution - this is a very large file. LZ Columbus - most of the artillery was fired from this LZ in support of X-Ray, and C 2/5 Cav marched to Columbus as they left X-Ray. In this picture, a Chinook helicopter is bringing in supplies. 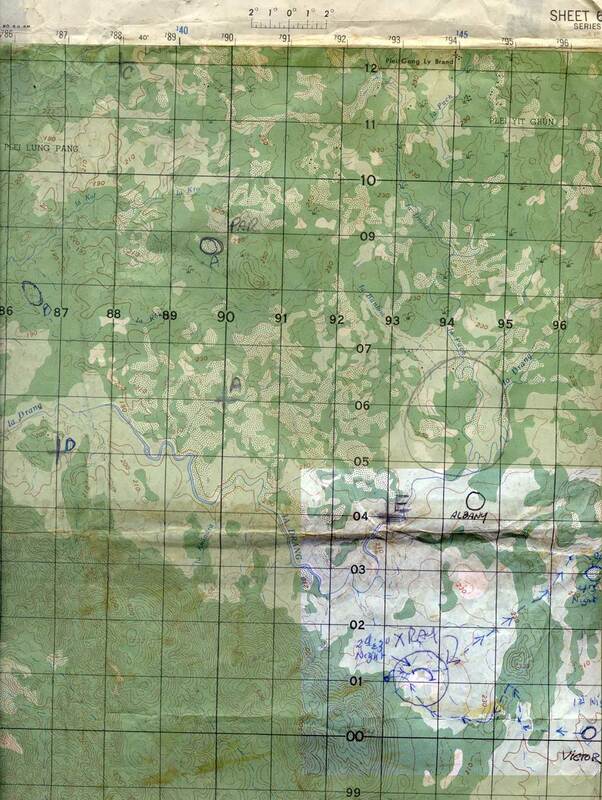 This is the map I carried as Company Commander of C Co, 2nd Bn 5th Cavalry in the Battle of the Ia Drang. When the 1/7th Cav. landed at LZ X Ray they were attacked by a North Vietnamese regiment. The 2/5th Cav. assembled at LZ Victor and the following morning, walked overland to reinforce the 7th Cav on X Ray. We remained there for two nights and then moved overland to LZ Columbus. The 2/7th Cav, who followed us out of X Ray, turned north towards LZ Albany. 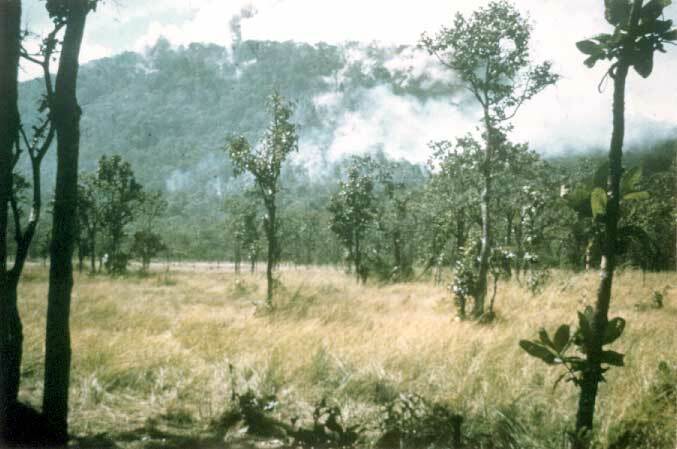 They were attacked by a North Vietnamese Battalion on the way and it became a fight for survival for the 2/7th Cav. The entire campaign lasted 35 days. While moving out of LZ Columbus, 2LT James Mullen is seriously wounded by a punji stake and evacuated to the 15th Medical Battalion. He recalls "he stepped forward with his left leg, but then his right leg wouldn't move" and he found himself impaled. The punji stake had punctured an artery, and he bled profusely. Needing to evacuate him quickly, the only open area was too small for a Medevac bird (a D Model Huey). 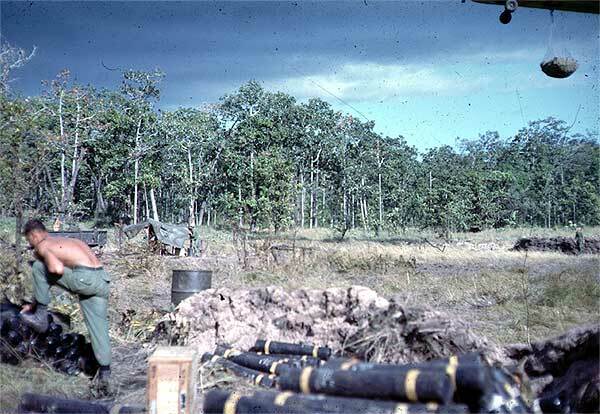 Lacking any C-4 explosive to blow a bigger LZ, it looked dark for Jim. But a nearby gunship pilot (a B Model Huey) heard the problem, went back to LZ Columbus where he dropped his door gunners and co-pilot), landed at the PZ by descending straight down (a very difficult action), picking up Mullen, then going straight back up. Back at An Khe under the care of the 15th Medical Battalion, Jim recovered - but only after telling the nurse that he couldn't take the pain of the penicillin shots anymore. Courtesy John Picciolo, formerly 2/17th Field Artillery. We were the practice people for airmobile concept. Never saw Fire Bases and LZ's as they evolved into later. I don't think we knew what was around us besides our perimeter grunts. We lucked out a few times as I think both sides were feeling out each other. We did dig a few holes but bunkers were for base camp. I thought we had it made compared to our security grunts. I did not have enough contact with these soldiers. 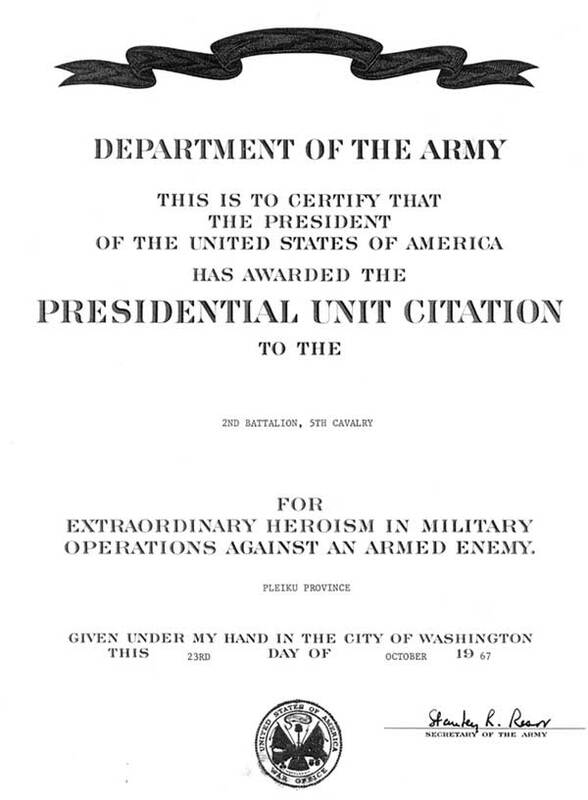 The entire 1st Cavalry Division was awarded the Presidential Unit Citation for actions during the Pleiku Campaign. 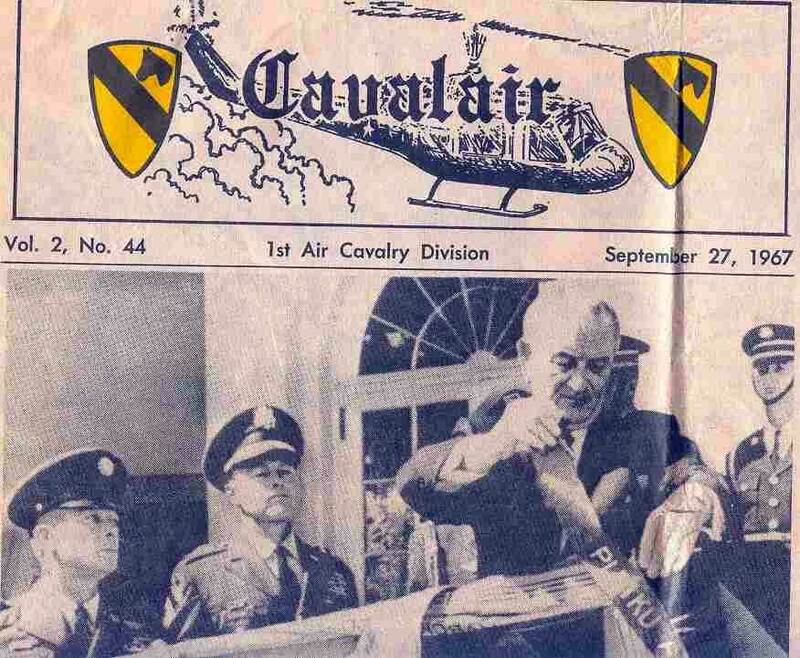 The Cavalair (the division newspaper) ran a photo and story of President Johnson awarding the Presidential Unit Citation in the September 27, 1967 edition.